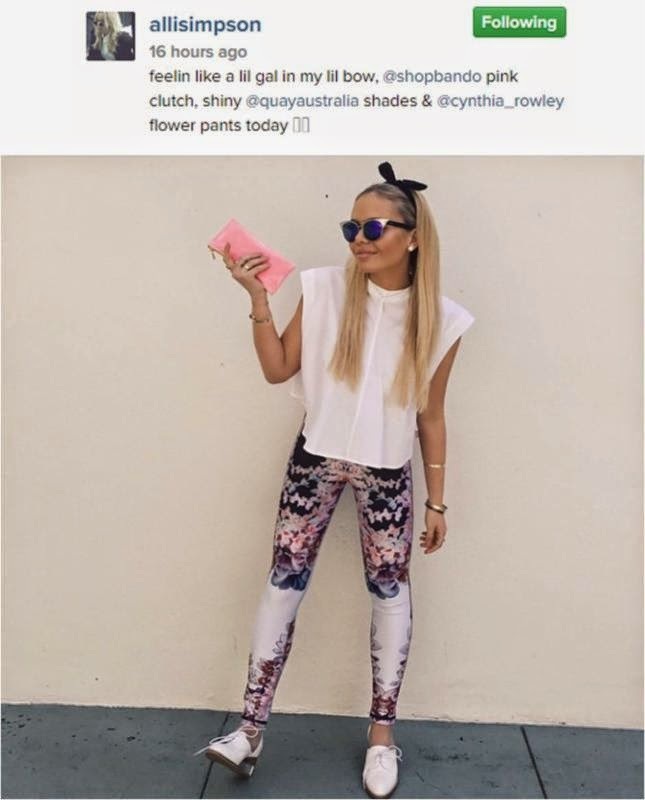 Alli Simpson posted a photo wearing Cynthia Rowley and carrying ban.do the other day on her Instagram account. The teen sensation looked fun and chic in her Bonded Leggings in White Force Perspective ($245; www.cynthiarowley.com) and accessorized her look with the Get It Together Pencil Pouch ($12; www.shopbando.com). Alli Michelle Simpson was born in Gold Coast, Queensland to parents, Angie and Brad Simpson, on 24th April, 1998. She moved with her family to Los Angeles for her older brother, Cody Simpson's career, who is now a famous Australian singer and has been winning awards since 2010. In 2012, Alli had landed a small role in her first movie, called 12 Dogs of Christmas: Great Puppy Rescue. Alli is a pretty, trendy, up and comer.